So, this Friday May 23-24 is a meteor shower and we're in for quite a show. Predicted rates of falling stars (or interplanetary chunks of rock) are quite high - 100 to 400 meteors per hour, which is far higher than a normal meteor shower. I just learned that the level of meteor showers can be quite unpredictable but at any rate, you should step outside into the night and see if you can catch the show. Start by taking a look once the sky is dark and check the sky about every hour or so. So get comfy, let your pupils dilate and pay attention. Meteor showers also have mystical and inspirational meanings. The ancients often thought of them as candles of the angels and souls, a sign from the devine. Wishing on stars is an age old tradition and one that should never be forgotten. Meteor showers can conjure ideas, give a surge of energy, make dreams more vivid, are a sign or a message; and I personally think it's the best time to make wishes, manifestation and intentions. One way to do this is simply get a pen and paper and write down your goals and intentions. You can either choose to bring your list with you while you watch, burn it to release it to the stars (Chinese flying sky lanterns or Flying wish paper are great for this) or just imagine your list and meditate while you watch the stars. There is no right way or wrong way to do this, it's important that it feels right to you. You can even make up your own ritual and have fun with it. P.s. 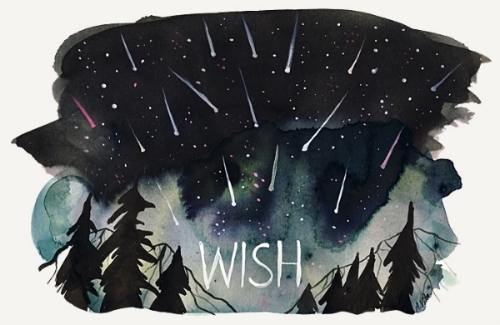 Love this Wishing on Stars print? You can purchase it in my shop. Share it on Twitter, Instagram or Facebook.